수 백 만명의 사람들이 ‘키스’를 의미하는 ‘X’로 메시지를 끝맺습니다. 오늘은 ‘X’가 어떻게 ‘키스’를 의미하게 되었는지 알아볼까요? Why does X mean ‘kiss’ in English? - How long have people been speaking your native language? - Does your language ‘borrow’ words or symbols from other languages? What are they? 안녕하세요! Listen Here에 오신 것을 환영합니다. 이 코너에서는 여러분이 영어 뉴스를 잘 이해할 수 있는데 필요한 표현을 알려드릴 거에요. 저는 손보람입니다. And I’m Tom! Hi everybody. 오늘은 메시지 마지막에 적는 ‘X’가 어떻게 해서 ‘키스’를 의미하게 됐는지 알아보겠습니다. BBC Radio 4의 Word of Mouth에서 오늘의 클립 Part 1을 들어볼게요. 편지에 ‘x’를 처음으로 쓴 건 언제일까요? 그리고 몇 번의 키스가 담겨 있었을까요? 숫자를 잘 들어보세요! 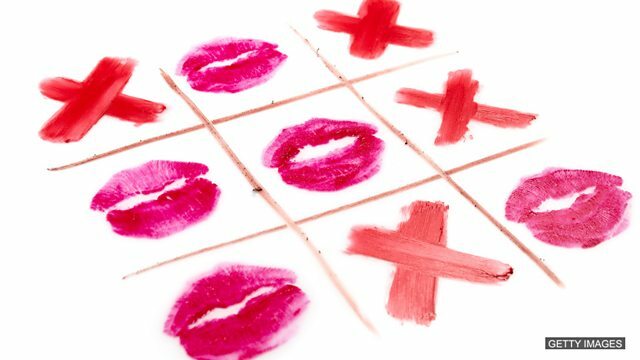 Well, we’ve been adding Xs, for kisses, at the bottom of our letters, since at least 1763, so the very first one we know of had seven Xs! She said ‘since at least 1763’ ! That’s right! ‘X’ starts with a vowel sound. Often, words which begin with vowel sounds can take the last sound of the word which comes before. ‘Seven Xs’, then, is pronounced ‘seveNexes’. I could also say ‘seveNever’. Listen again for ‘seveNexes’. Which verb and preposition come before? She said ‘the very first one we know of’. 어떤 것이 존재한다는 것은 알고 있지만 그 대상에 대해 자세히는 알지 못할 때 ‘know of’라는 표현을 씁니다. 무언가에 대해 잘 알고 있음을 암시하는 ‘know about’과는 다릅니다. We know of the letter, but we still don’t understand our main question! We need to know about X. Why does X mean 'kiss' in English? Let’s listen to the rest of the clip for the answer! ‘X’라는 글자는 어디에서 유래되었고 어떻게 발음하나요? Oh! That’s nearly a kiss, isn’t it?! Yeah, it is, isn’t it? I think a penny’s just dropped there. So, X comes from the Roman alphabet! And they pronounced it ‘kss’. The Roman alphabet 로마 알파벳을 의미합니다. 두 사람이 이해한 바가 맞는지 서로 확인하기 위해 어떤 질문을 하는지 다시 한번 들어볼까요? Yeah, it is, isn’t it? 두 사람 모두 부가의문문을 사용했습니다. 절 뒤에 오는 의문문이죠. So, after ‘it is’, we could say ‘isn’t it?’. 정답이에요! 상대방의 반응을 이끌어내기 위해서 두 의문문 모두 강조가 되었습니다. 문장 끝 억양이 올라가죠. That’s right! Repeat after me. We’ll begin with the stressed question. Ready? 두 사람 모두 부가의문문을 사용해서 서로 이해한 바를 확인했습니다. 그리고 나서 어떤 관용구를 사용했어요. 다시 한번 들어볼까요? They used the idiom ‘the penny’s dropped’. ‘The penny has dropped’는 드디어 이해가 되었다라는 뜻입니다. Hopefully, the penny’s dropped for you, too, now we know about X, and we know why it means kiss in English. I think this is a good time to finish, isn’t it? Listen Here 과 함께 해주셔서 감사합니다! See you next week everybody! And I’m signing off with an X! Listen to today’s clip in full here. Consonant to vowel linking is when the first word ends with a consonant sound and the second word begins with a vowel sound. You’re an English teacher, aren’t you? School isn’t open next week, is it? You work in the bank, don’t you? Thanks for explaining our homework! The penny has finally dropped and I won’t need any more help. 틀린 답은 자음으로 시작하지 않습니다. 부가의문문은 앞의 질문이 긍정형일 경우 부정형으로, 질문이 부정형일 경우는 긍정형으로 씁니다. Join us for our next episode of Listen Here when we will learn more useful language and practise your listening skills. 다음 주 Listen Here 에서도 유용한 표현도 배우고 리스닝 실력도 키워보아요!